Downsizing, but don’t want to get rid of your things? We have 30,000 square feet of climate controlled storage space. When it comes to storage the answer is a no-brainer when comparing us to our competitors. Our security system watches out for you around the clock and our fire protection keeps your things safe as long as you need. Striving to have more moving and storage options than anyone in the business, GoMinis portable storage has been the solution. 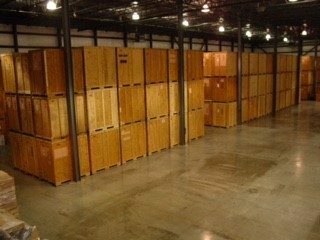 If you need short term or long term storage, we have you covered! Store the container on site or at our warehouse for as long as you like. Does your company need to warehouse product? Are you building a new restaurant and need a place to ship your equipment while building? Are you a builder that needs storage while working on a project? If so we have you covered. And many more industries to take care of their warehouse needs. We not only warehouse, we receive, inventory and deliver. Let us know how we can take care of your warehousing needs. Tim, our driver was very good. DJ, Chris and Melissa were fantastic and very helpful!